Illinois has nearly 7,000 local governmental entities -- more than any other state. 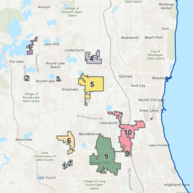 Lake County has more than 200 local government units and the County Board is taking steps to consolidate or dissolve those districts (that it has control over) in order to enhance efficiency, accountability, and cost-savings. Chairman Aaron Lawlor explains in this video, and learn more by reading the Consolidation Action Plan. We’re entering the final phase of construction and the installation of exhibitions at the new Bess Bower Dunn Museum of Lake County, set to open to the public on March 24, 2018. The new Collections Care and Storage Facility in the lower level of the Dunn Museum is complete. It offers stable environmental conditions suitable for protecting the Museum’s irreplaceable historic collections. To date we have moved the entire Lake County History Archives and a significant portion of the object collections. Work will continue over the coming months to complete the move. Lake County property owners can make a pre-payment for the 2017 tax year to the Lake County Treasurer’s Office through Dec. 29. This could benefit you when filing your 2017 income taxes. Visit the Treasurer’s Office website to learn more. Do You Have Unclaimed Funds Held by the State? The Illinois State Treasurer is holding $2.5 billion in unclaimed funds for Illinois residents. The State holds these lost funds until they are claimed by either the original owner or their heirs. Property is returned at no cost with the proper identification. Find out if you have unclaimed funds. December is Here! SNOW SEASON is Upon Us! Have you ever wondered what it looks like from behind the wheel of a snow plow? Watch this video taken from a dashboard camera last winter, and learn more about our operations as the plow clears Lake County highways. Which roads do we maintain? Map of LCDOT Snow Routes. Did you know that you can look in on the road conditions from your computer or mobile device before you hit the roads? You have access to the PASSAGE cameras which means you can look at real-time snapshots from major intersections, like this image taken last winter. Go to LakeCountyPASSAGE.com, turn on camera images in “Layer Options” at the top right, find intersections along your route, and check road conditions in each direction. LCDOT Snow Season Story Map: This interactive mapping tool explains everything you need to know about our snow and ice removal operations. Don’t Crowd the Plow: Watch this to learn valuable safety tips. Give plow drivers space to do their jobs, and we can all get to our destinations safely. Ask A Snow Plow Driver: You asked your questions, and our plow drivers answered! Hear directly from them about what they see on the roads, and the challenges they face when clearing the roads for you. If you have additional questions, you can submit them here: Ask A Snow Plow Driver. You may have an emergency supplies kit for your home, but what about your vehicle? Make sure to keep a shovel, blankets, booster cables, and these other items in your car this winter. The Lake County Board recently thanked more than 300 people who serve on various County Board appointed boards, commissions, and other special purpose units of government. This ranges from drainage and fire districts to the transportation service boards, human services boards and the Board of Review. These dedicated volunteers make decisions and deliver services that our families and businesses depend on every day. Watch this video to see more from this event. There are opportunities for residents to serve their communities in an appointed leadership role. Those interested are encouraged to view the County Board's website. The Middlefork Bridge and Trail Connection is now open. The new bridge connects 4.5 miles of trails at Middlefork Savanna Forest Preserve in Lake Forest to the Lake Forest Academy and Townline Community Park and provides trail users a safe passage over the Metra Railway. Other new elements include a scenic overlook and crosswalk improvements at the intersection of IL Route 60 and Academy Drive. This project is part of a larger effort by several organizations to connect Middlefork Savanna and the Middlefork Trail and Greenway to the Des Plaines River Trail at MacArthur Woods Forest Preserve in Mettawa. 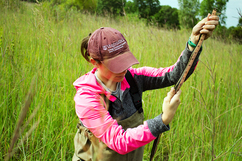 We are pleased to have worked with the following partners and donors to make this project possible: City of Lake Forest, Lake Forest Academy, Lake Forest Bank & Trust, Lake Forest Open Lands Association, and Richard and Elizabeth Uihlein. View Map. Carol and Ed’s home is surrounded on three sides by a beautiful forest preserve. 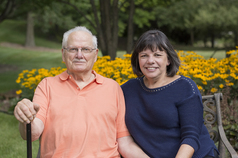 Appreciation for their Forest Preserve neighbor and a life-long love of nature led Carol and Ed to support the Preservation Foundation of the Lake County Forest Preserves in their will. If you are grateful for all the Lake County Forest Preserves provide, consider making a planned gift through your will or estate. There are many ways to leave a legacy, including gifts of cash, land, a vacation home, or life insurance. Whatever you choose, the impact of your gift will live on for years to come. Carol and Ed are extending the impact of their legacy gift by joining the Preservation Society. Why join them? Because we want to acknowledge your gift and celebrate your commitment to the Lake County Forest Preserves. Also, allowing us to recognize you in our publications lets others know that the Forest Preserve mission is worth your investment. For more information or to become an inaugural member of the Preservation Society, contact Ellen at 847-968-3448. The Lake County Stormwater Management Commission recently hosted the 2017 Homeowners Floodproofing Expo and Workshop, a great opportunity for homeowners and property owners to learn about products, services, and solutions to minimize flood damages to homes and properties. If you couldn't attend the workshop, don't worry! Check out this video to learn more, and connect with additional flooding resources and information. Lake County Public Works operates 35 active wells. To make sure customers have a safe and reliable water source, we invest $125,000 per year to maintain and preserve these wells. Routine maintenance ensures the pumps run efficiently and water is delivered safely to our communities. This year, maintenance was performed on wells in the following systems: Mill Creek, Oak Terrace, Brooks Farm, Countryside Lake, and Pekara. Learn more about the water distribution systems operated and maintained by Lake County Public Works.